Once your baby starts to crawl, a strategically placed baby safety gates can make your life a little easier, your child a lot safer, and provide peace of mind. Keeping your baby away from potential dangers, such as stairs, home offices, pets, exercise equipment or rooms that have a lot of hazards is essential for their safety. The MOST important and MOST difficult task is choosing the CORRECT safety gate. 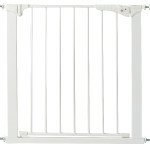 Baby Safety Gates come in different shapes and sizes as well as different mounting styles. Choosing the correct gate for each particular situation is critical. Most new parents, with the best of intentions, visit the local Babies R Us, Buy Buy Baby or on line baby store and choose a gate based on appearance and reviews. Unfortunately, more often than not, you choose the incorrect gate but try to make it work. This is like trying to put a square peg into a round hole. If you don’t choose the correct gate, the installation will never be correct and the gate will not work properly from day one. And just because someone else gives a gate a positive rating on line, does not make it the right gate for you. Baby Safe Homes will help you choose and install the RIGHT gate the first time, minimizing damage to your home and ease of functionality. We provide only the BEST safety gates with the JPMA seal of approval. 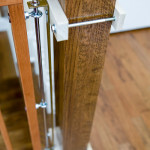 We also have a custom NO HOLES mounting systems for a more secure installation and to avoid drilling holes into your stair banisters. 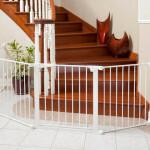 We have divided our safety gate photo gallery into the three major categories of baby gates . Mounted gates which are typically used for stairways, main hallways and high traffic locations. We also offer custom sectional gates for irregular and large opening. Then the pressure gate is typically reserved for doorways and lower traffic locations. Each category has a few examples of installations that Baby Safe Homes has performed. Your local safety consultant can help determine the correct gate for you. 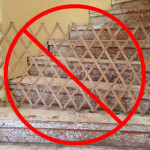 Child safety gates are intended for children between 6 months and 2 years of age. Once a child learns how to open a gate, or can climb over it, it should no longer be relied upon as a safety device.